The world famous Lathmar Holi of Barsana was played on 21st March. It was a spectacular and delightful event at Ladli Ji Mandir of Barsana. 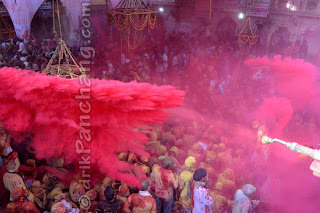 The whole temple premises were covered with the clouds of Gulal and the showers of wet colors. This event was watched and participated by thousands of visitors and devotees. It is believed that Lord Krishna used to visit Barsana to play Holi with His beloved Radha and other female cowherds. This tradition is still kept alive by the people of Barsana and Nandgaon. This ancient tradition of playing Holi was organized well in advance with all rituals. One day before, the invitation was sent to the men folks of Nandgaon to visit Barsana to play Holi. The invitation was sent along with dry color which was distributed to all households in the town. In Nandgaon, the invitation was accepted with full fanfare along with music and folk dance. The RSVP or the acceptance from Nandgaon came to Ladli Ji Mandir on the same day by one messenger known as Panda. Huriyare* visited Barsana with full enthusiasm and preparation to play Holi. Huriyare came along with leather shields to protect themselves from Huriyarine. Huriyarine protested all attempts to smear them with Gulal and colors with the help of bamboo sticks. In defense, Huriyare used leather shields to take impact of bamboo sticks. As Holi in Barsana is played with bamboo sticks it is known as Lathmar Holi. It is believed that in the ancient time this was made a tradition to hone defense skills of female folks of Barsana. *Huriyare and Huriyarine are the words which are widespreadly used in Mathura and Vrindavan during Holi to denote men and women folks respectively. Huriyare (हुरियारे) are the men folks who are in full enthusiasm to play Holi and Huriyarine (हुरियारीने) are the women folks who are also in full enthusiasm to protest any attempts by Huriyare to smear them with colors.